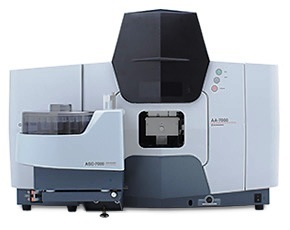 The AA-7000 series of Atomic Absorption Spectrophotometers features high-sensitivity analysis, flexible system configuration, and a compact footprint for user-friendly operation. In addition, the AA-7000 systems are the first AAs to employ a vibration sensor as standard. The AA-7000 series ensures efficient and comfortable operation in your laboratory. The AA-7000 Series incorporates newly developed 3D double-beam optics. The optical system has been designed to produce its maximum performance for each measurement method through optimal adjustment of the light beam and light beam digital filter, and by using optical components that restrict light losses. Safety is an extremely important consideration for flame atomic absorption spectrophotometers using acetylene gas. The AA-7000 Series instruments are the first ones in the world fitted with a vibration sensor as standard. They also incorporate a comprehensive range of safety mechanisms, including gas leak detectors.